How to maneuver your Spa Cover on and off the Spa and best practices for storing it when the Spa is being used. A spa cover is generally not a heavy item. The average spa cover would weigh between 11 and 17 kg. but the overall size of the cover could be as much as 3 sq. metres folded for a '6-8 person' spa. It's this bulkiness that can make the cover awkward to maneuver. 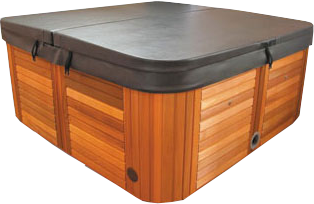 As with most things, by applying the correct techniques, the job of moving the spa cover on and off the spa can be relatively easy. The best example I can give of how best to move a spa cover on and off a spa is by comparing it to a supermarket trolley. I often watch with amusement as shoppers try to negotiate supermarket aisles with their trolleys by standing in one spot and trying to swing the trolley around to change direction. This requires a lot of effort and is quite impacting on the body. Instead of trying to move the trolley, if they in fact move themselves around the trolley and then just push in the direction to which they want the trolley to go, it's incredibly easy to move around the store. So leaning a cover against the spa to create a tipping point, simply lift the end that's resting on the ground until the cover is horizontal and then slide it into position. Move around the cover as required and avoid staying in one spot trying to maneuver it. The exact same procedure can be applied in reverse to remove the cover. Move around the cover as much as required to move it toward a spa edge ( pull it away from the spa until you reach a tipping point ), then simply lower the end of the cover to the ground and slide the whole cover off the spa. Sound complicated - best to watch a short video clip on how it's done. No need to strain your back. Your Spa Cover has handles. Our advice - don't use them. Why does your Spa Cover have handles? Probably for the same reason humans have an appendix? If we had our way we'd make our covers without handles. Unfortunately everyone wants handles on their Spa Cover, so we still make handles. Use the skirt to carry your cover, it's much stronger. Don't pull your Spa Cover by the lock straps or steam stoppers. Don't drop or drag your cover. If handled with care, your Spa Cover will give you many years of excellent service. 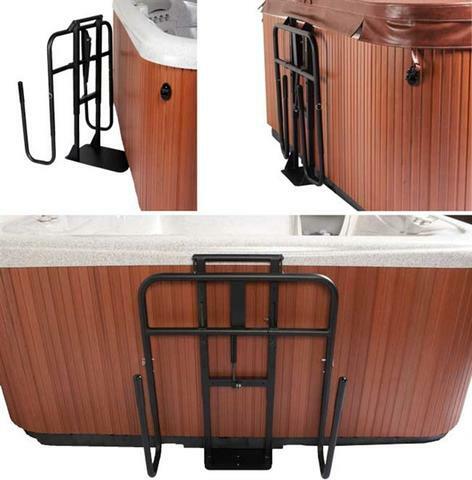 Cover Lifters are mechanical devices designed to make Spa Cover handling easier. You can ask our experts for details. It's a good idea to stand your Spa Cover up with the folded centre ( zip area ) facing downward. This assists with condensation drainage. Always store your cover out of the sun. The Polypropylene underside is purposefully designed to withstand chemicals, water and heat but it is not UV stable.